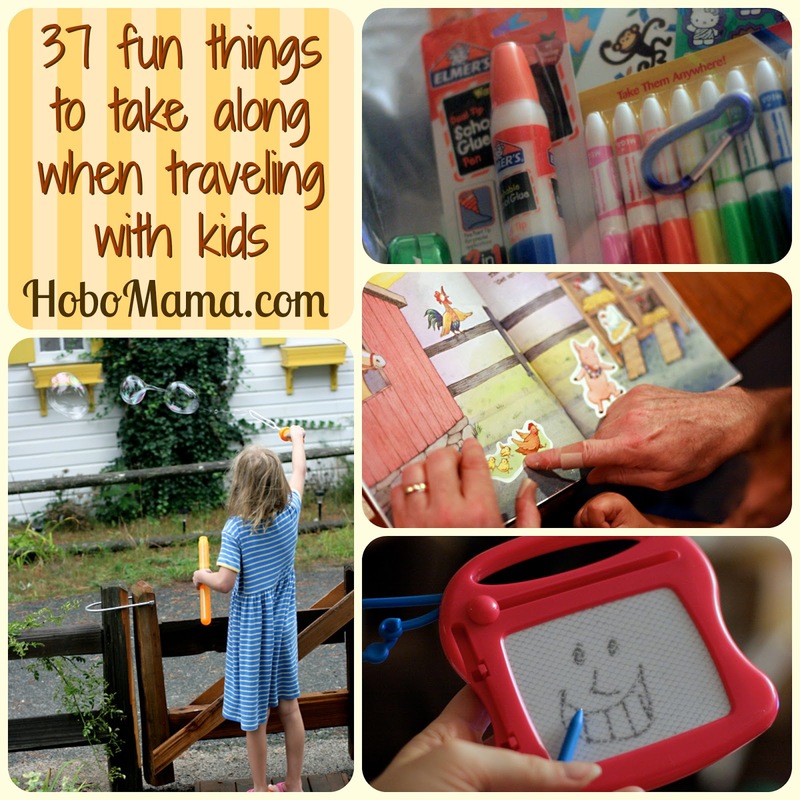 This post is part of my special HAVE KIDS, WILL TRAVEL series to give you advice and wisdom on traveling with kids along with some fun giveaways of travel-friendly items. I am going to give you a picture show of all the child-amusing things I thought to pack or actually did take along on our most recent trips: to Cape Cod in August, and to Michigan this November. These items were to entertain one three-year-old son and one eight-year-old niece so will hopefully work for a range of ages. You don't have to bring them all, but I thought they would give you an idea of lightweight, travel-friendly amusements that might help you as you journey by car, plane, train, or boat — or even just when you're in a waiting room or restaurant or at a relative's house, and you really want something entertaining but portable for your kids to do. I've concentrated mainly on the toddler to elementary school age group, mostly because babies can be amused by chewing on keys and used napkins — or not, as the case may be — and in any case, more stuff doesn't usually do much to keep them occupied. 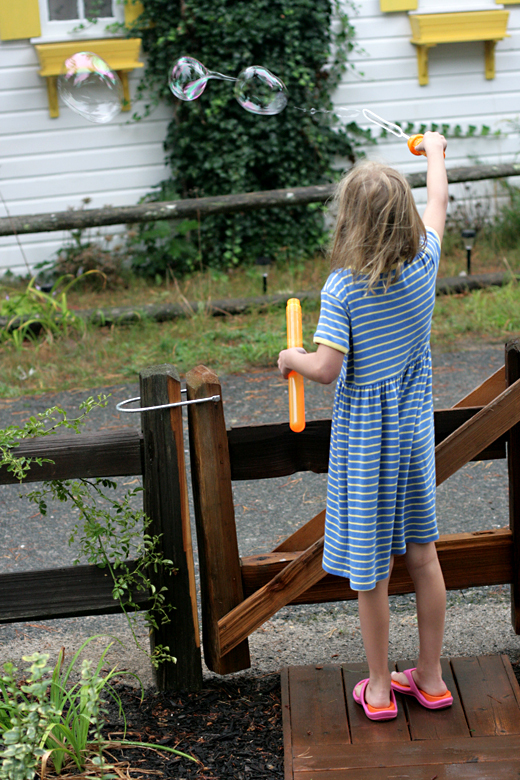 As far as older kids go, they probably have their own ways of entertaining themselves, but plenty of these ideas (games, free-form toys, etc.) can be adapted for their use as well. For my target age range, toddler through primary grades, I assume your kids are much like ours — able to amuse themselves for small amounts of time on their own, but craving a lot of adult interaction. So I tried to find easy ways to provide that, in portable and quiet quantities. I want to ramble briefly before I launch into my picture show. Sorry for missing Sunday Surf this week. I have been slamming NaNoWriMo after considering myself for some weeks hopelessly out of the running — and, my friends, I have won!! Woot! I seriously wrote almost the whole novel in the past week and a half, but more on that foolish optimism later. Note that many items can work in more than one category, somewhat depending on your mode of transportation. 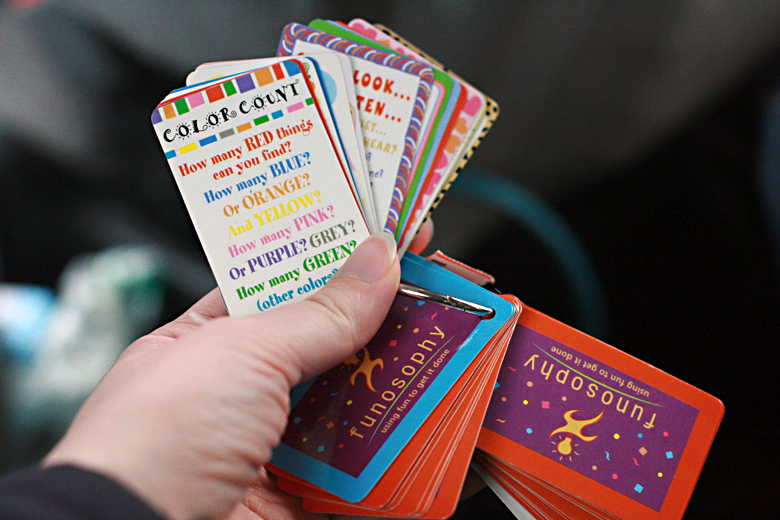 A card game can work well on a train table, for instance, but it can be more challenging in a car, particularly if some passengers get motion sick. This is a lot of pictures and ideas, so I totally give you permission to skim and just see what items catch your eye! And give me your own ideas in the comments. 1. 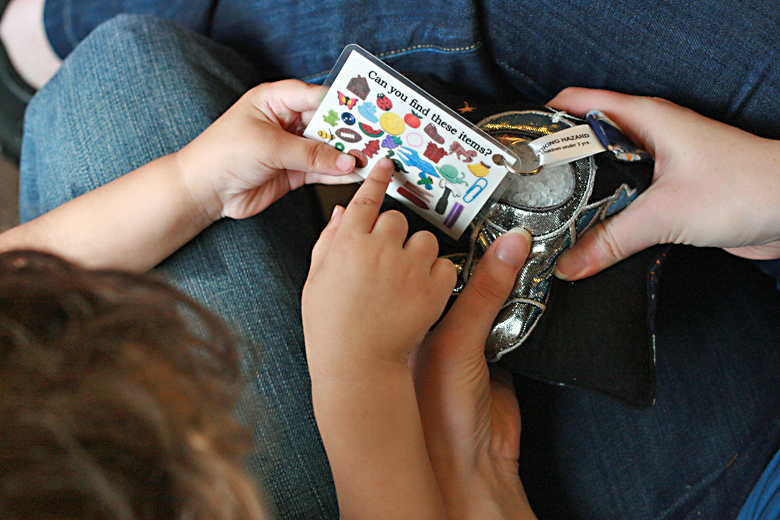 Your kids can go on a treasure hunt with an I Spy Bag like this one from Giggle Junction. This was a huge hit with everyone on the trip — my niece and the grandparents included! Everyone got in on the scavenger hunt action. You can enter to win your own choice of an I Spy Bag (open worldwide!) by tonight. This would be perfect as a stocking stuffer or for holiday travel. Because I'm posting this so late, though, you can enter till I close the comments; I'll plan to give everyone a bonus half-day, so head on over and pick out your favorite and just leave a comment on the review post. 2. 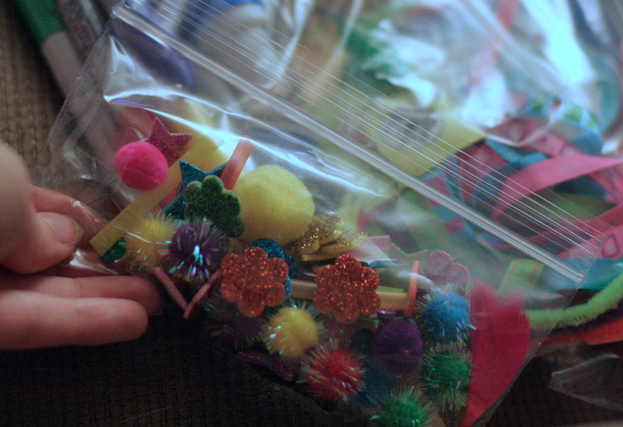 If your kids like making crafts (or "decorations," as Mikko fondly calls them), a tote pack of arts and craft supplies can be just the ticket. Keep the glue in stick form for neatness, and look for travel-friendly tools, like these mini washable markers. I added in a petite pad of construction paper, some new stickers, and a travel cellophane tape, and we were set for use on the airplane tray table. Make sure you keep your supplies contained — I used see-through plastic so I could take a picture! But you could easily use a tote bag or a zippered pouch; look around and see what you've got that will fit a nice selection. 4. 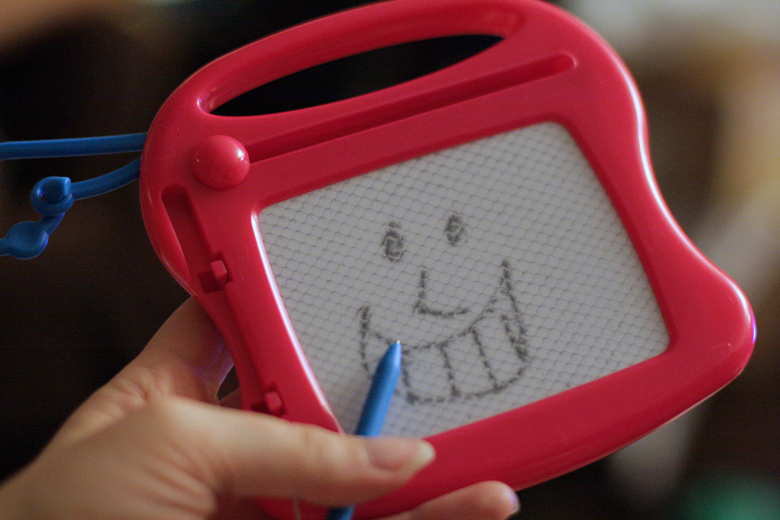 Another option is a Magna Doodle , or in our case, a knockoff that does just as well. 5. 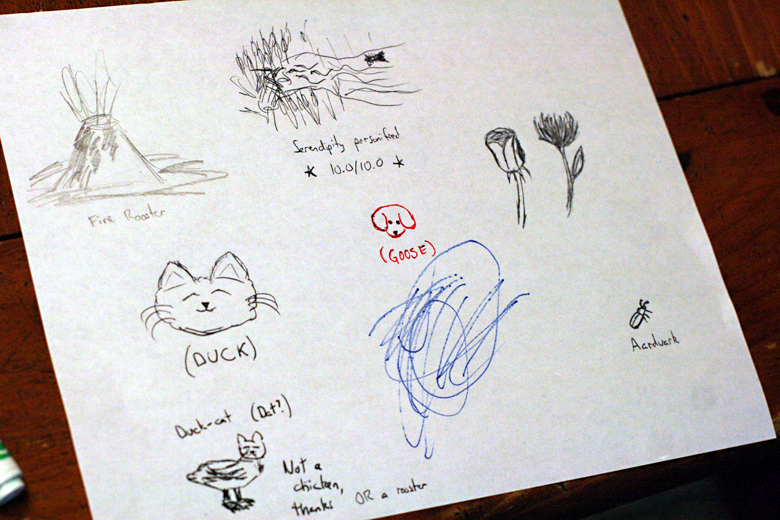 Doodling, whether by you or by the child, is easy to do with just a single scrap of paper and whatever pen you might have handy. My clearly talented younger brother offered this masterpiece to Mikko. My mom used to love drawing out logic puzzles or word tricks for us to guess (such as this one, not even joking). 6. Books are obviously always a solid choice for entertaining children quietly on the go. 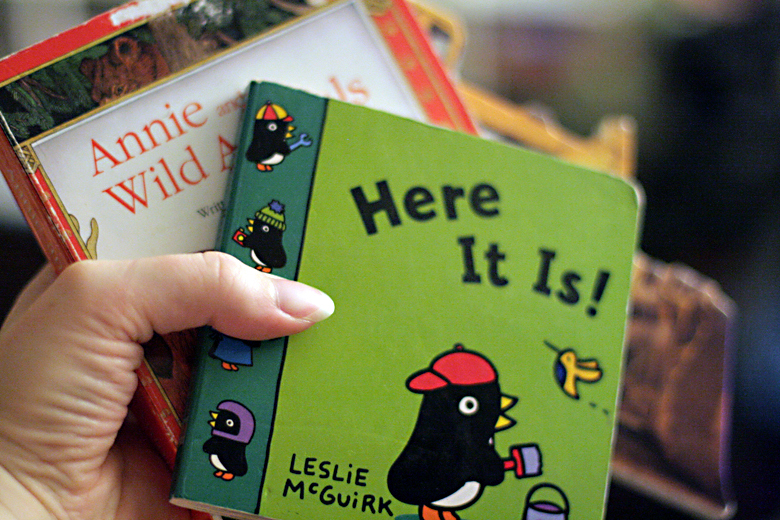 I went to the consignment shop to pick up a few new miniature board books so they would be new to Mikko and easy to pack, but you could just as easily raid your own bookshelf or, if it's a brief enough trip, check some interesting new ones out from the library. I added in a few that dealt with travel in particular. And I looked specifically for ones that had interactive features, such as pop-up flaps, very popular with younger pre-readers who might not sit still for a whole story otherwise. 7. 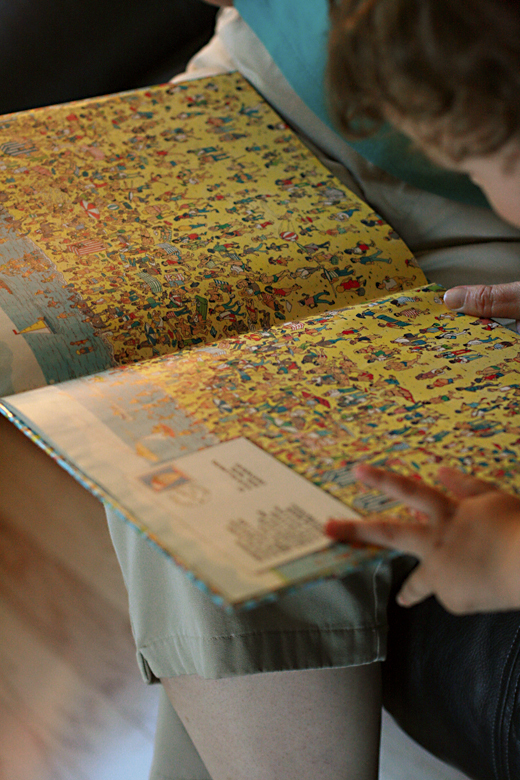 Another book that's good for keeping little ones occupied for a time is the Where's Waldo? series or other similar search-and-find books. 8. If you want to act out your books, a felt story in a travel flannel board works great for storytelling on the go, because the pieces stick to the flannel and then roll up compactly and safely for storage. You can enter to win your choice of felt story and travel flannel board by tomorrow night, December 1! (Contest open to U.S. only.) This would make a perfect holiday gift for someone special. You can look for additional and affordable stories for your flannel board at GlitterfulFeltStories.com. 9. 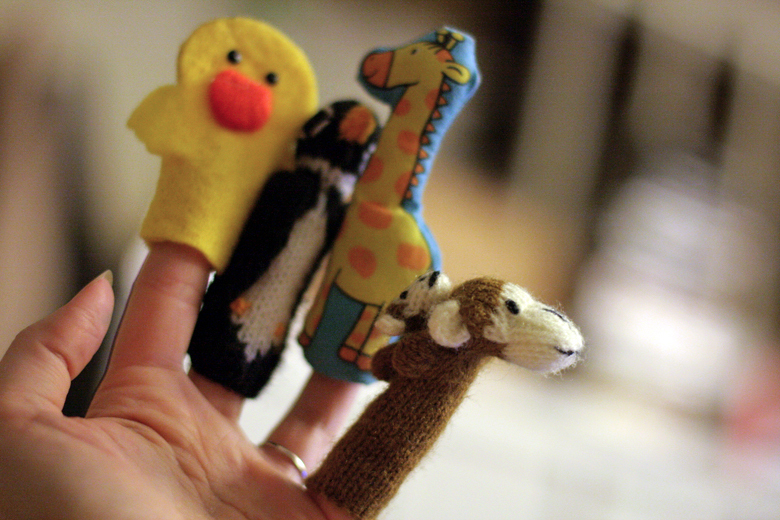 Another way to act out stories is with finger puppets, which are easy to tuck into a pocket, purse, or diaper bag. 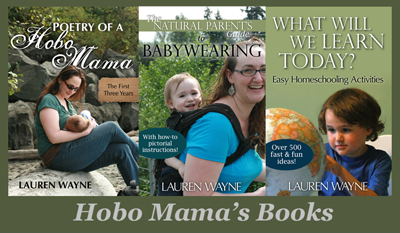 Do you love the babywearing monkey mama? I found that in London when I was pregnant the first time and just had to have it. 10. 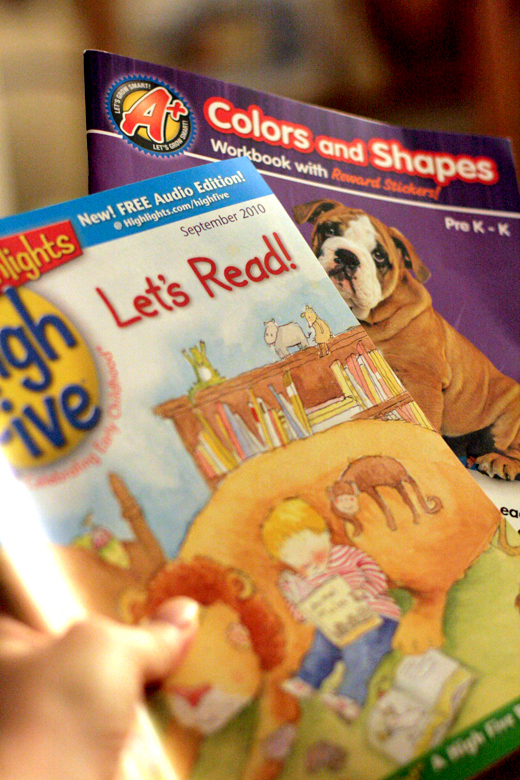 Besides books, you can bring along kids' magazines and workbooks. Grandma bought us a subscription to High Five (for preschoolers), and Mikko likes it a lot. Other ones I enjoyed as a kid included Highlights (slightly older) and Cricket (slightly older than that). 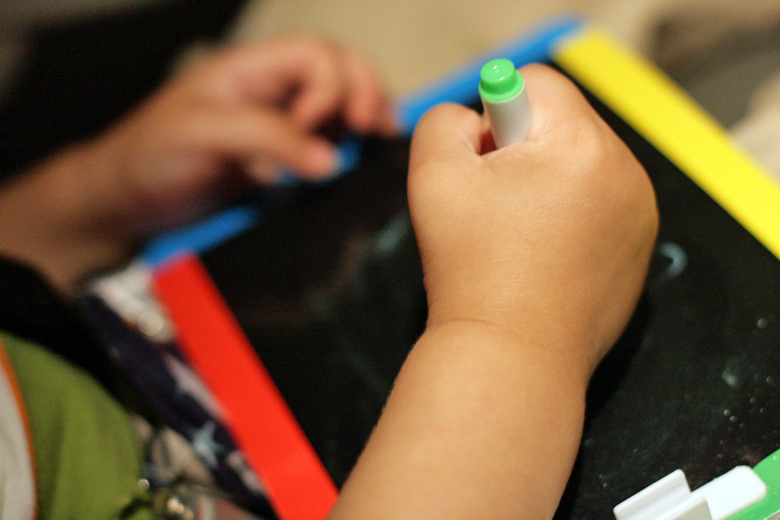 Worksheets and workbooks could be perfect for your kids if you don't mind that sort of thing; I know I actually loved doing math and reading worksheets when I was a kid, but I was like that! 11. There are a lot of cute reusable sticker books out there, so that stickers can decorate scenes and then be moved to new locations, as Papa and Mikko are doing. 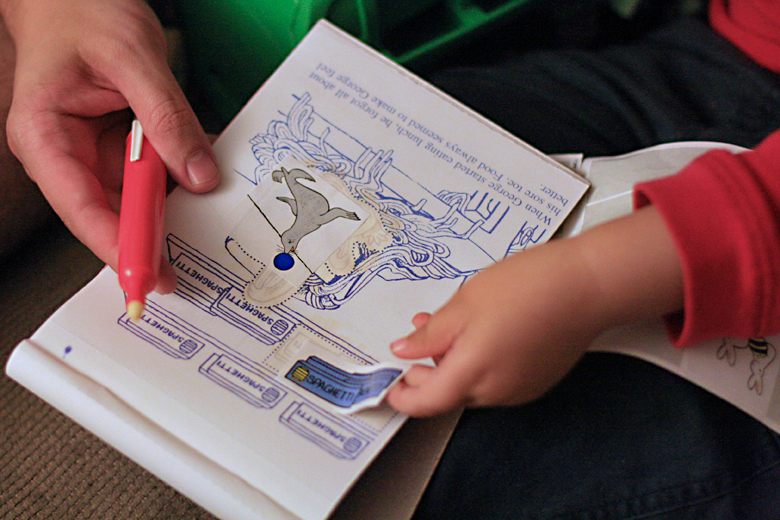 Other ideas to get children interacting are activity books, coloring books, and tracing books. 12. And don't forget Magic Pen / Invisible Ink books. Did anyone else think these were the coolest thing growing up? 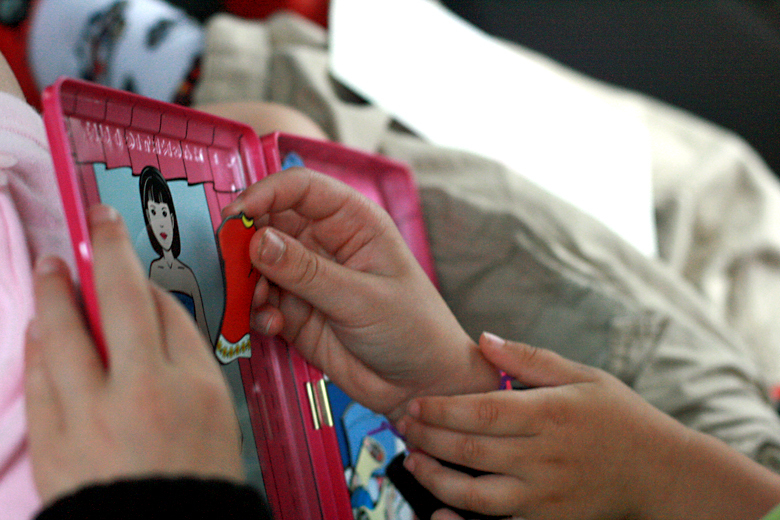 We always seemed to buy one on a long road trip to play Battleship and Hangman and other games. 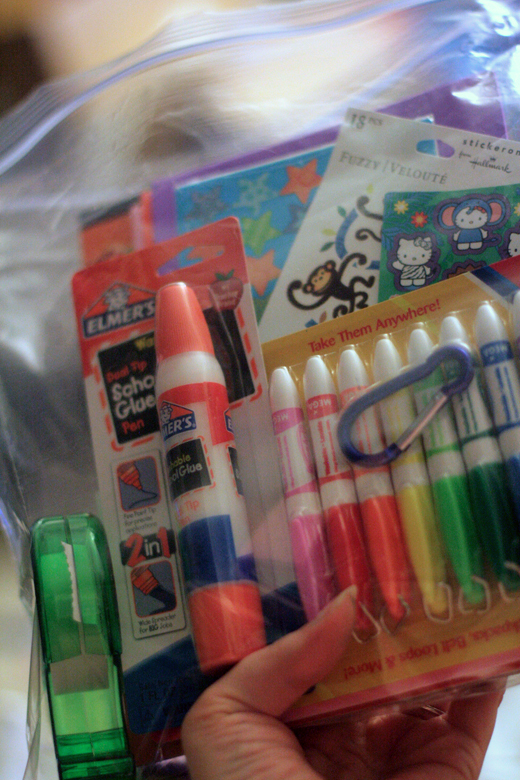 They have ones for younger kids that are more like coloring or reveal-the-picture books and that include stickers. 13. 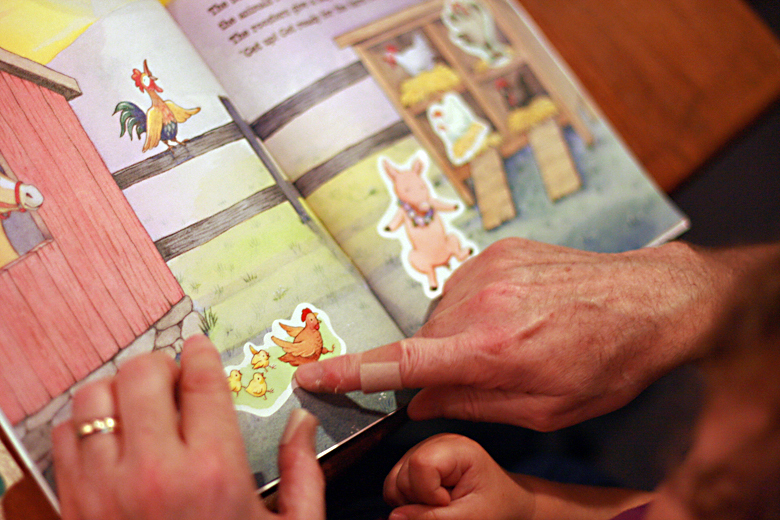 For younger toddlers and babies, picture books can be the best bet to keep them looking at the pages — particularly if the pictures include them! This is part of a "Who Loves Baby?" book we put together for Mikko starting when he was still a little guy, so he could start keeping track of our family members and friends who live far away. Even for older kids, a photo album like this, picturing the relatives in question posing with the child, can be a great way to jog their memory about the names of each uncle and aunt. You can buy a specialty children's album with soft pages if your baby's likely to drool on them or just buy a small brag book or photo album (more pages, so more photos!). 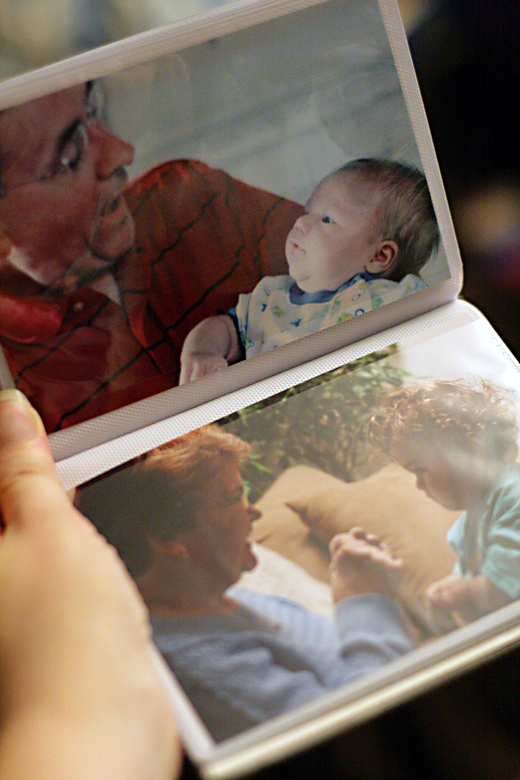 You can easily swap out photos as your baby grows. 14. Magnets can help keep little pieces in place, as seen in these magnetic paper dolls or magnetic checkers sets and memory games. I scored our rather vintage-looking set at the consignment shop. 15. If you have a smartphone, it's easy to download free children's games to amuse your little ones wherever you and your phone are. 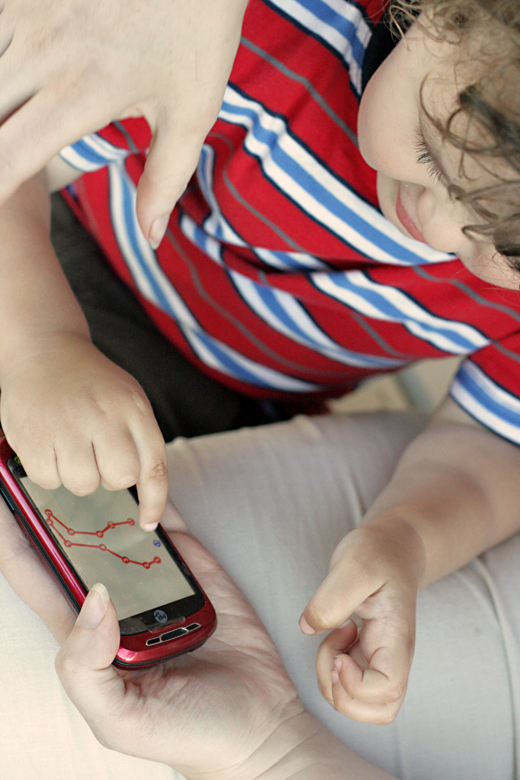 Mikko likes a matching game on his aunt's phone, and this connect-the-dots game on ours. 16. 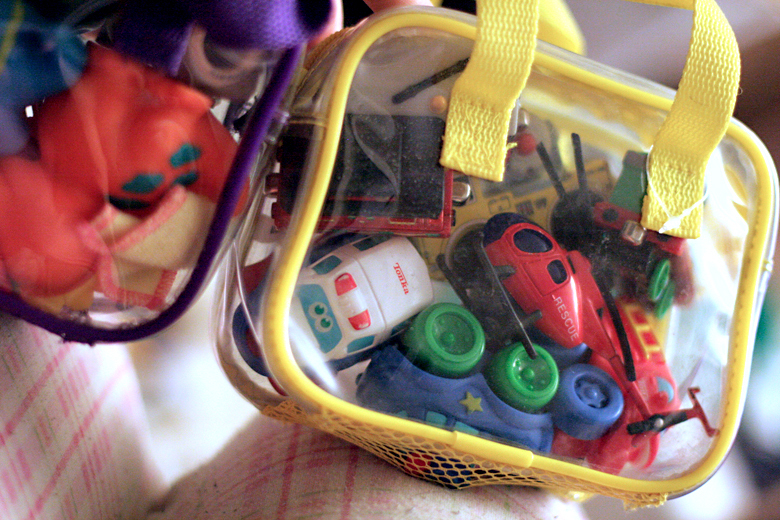 Finally, keeping a stash of small and unfamiliar toys can make you into something a fairy godparent during a long journey. I liked whipping something new and interesting out of our carry-on bag at regular intervals, whenever it seemed Mikko was about to totally flip out from boredom. 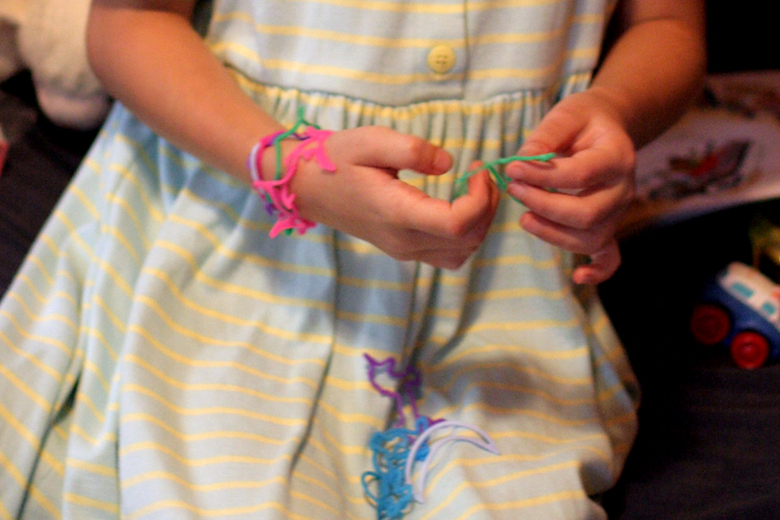 Nana got in on the action when we arrived, passing out Silly Bandz to the kids. Another fun idea on arrival is those little sponges that expand in water (not a great idea in a moving vehicle, though!). 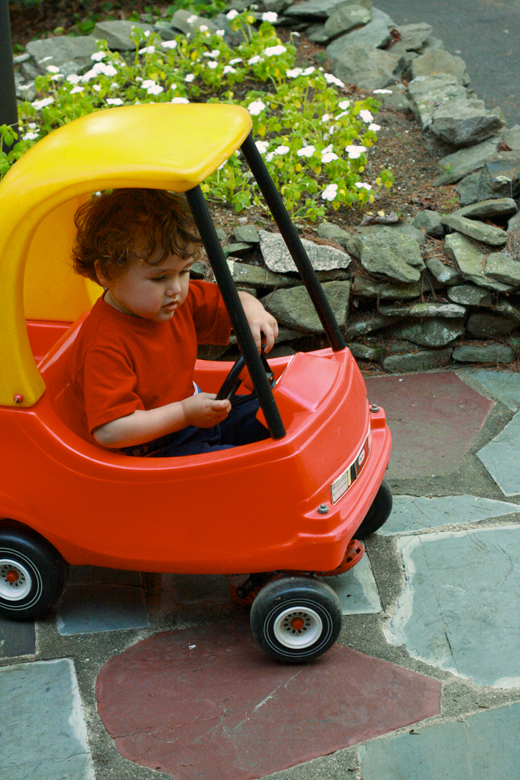 Depending on the kids' ages, you might be able to get away with recycling old toys they haven't seen recently. To save money, you can also check out thrift stores and consignment shops for tiny treasures. 17. Bubbles and other liquids are not the best idea to bring through airport security or into a moving vehicle, but they're perfect for outdoor fun when you've arrived, and easy to pick up at your destination. 18. 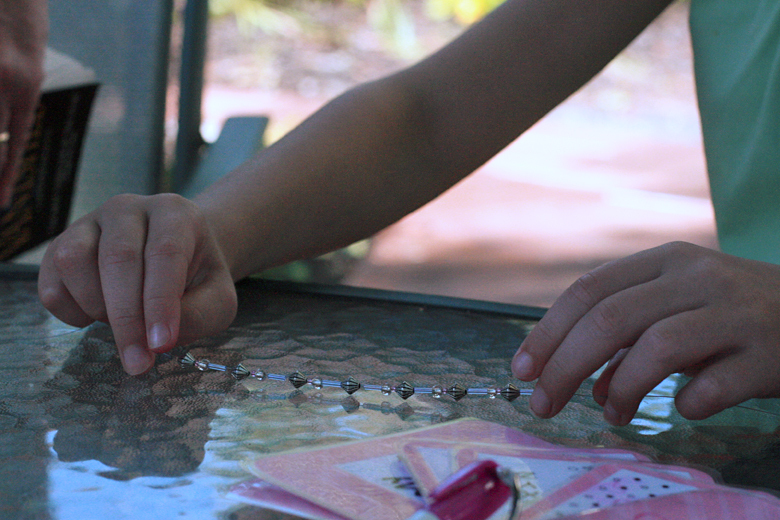 I didn't dare bring tiny little beads into the car or on the train, but they made for a pleasant afternoon activity with my niece as we made necklaces to give as gifts. Just be sure to package tiny little craft items like this securely, and bring all the parts you need. For beads, that's beads (um, yeah), some form of cord or string, and fasteners (optional). 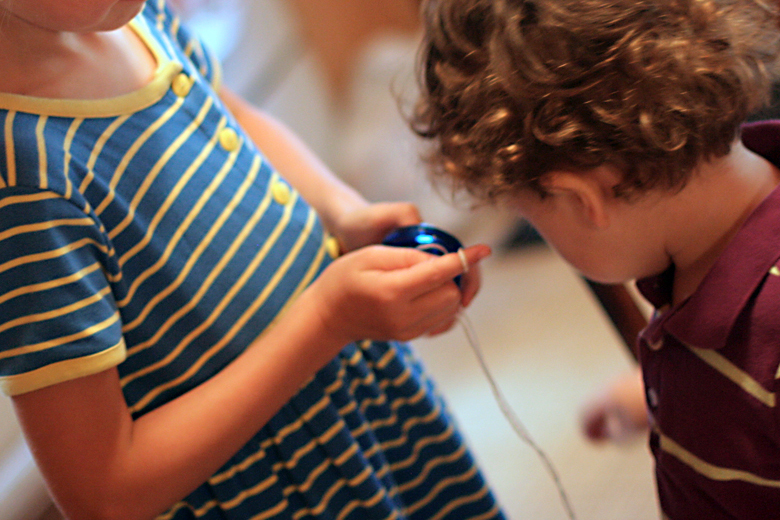 For younger kids, you can use bigger beads and cords. Lacing cards can be a good choice as well. Other fun travel-friendly crafts can include cross-stitching and knitting or crochet, if the child in question is mature and coordinated enough to begin learning a new skill. 19. 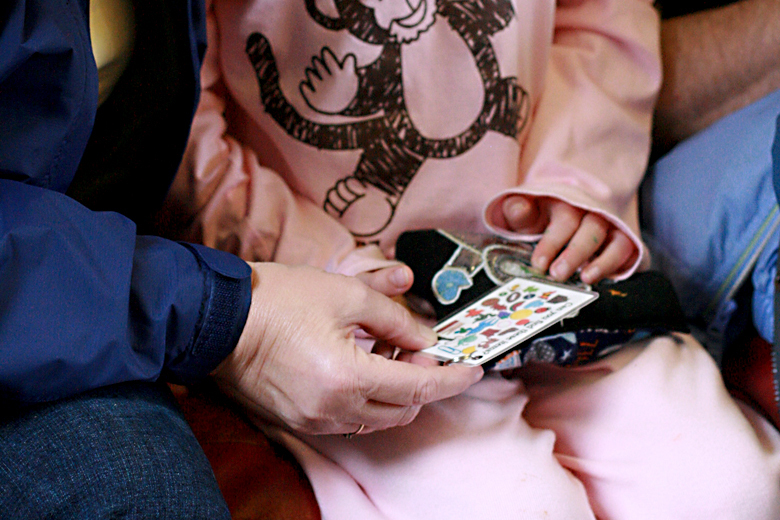 Any type of card games can work for various ages. Younger kids just think it's fun to pretend to play and point out the numbers. Witness our little card sharp above. My dad taught us euchre, which is a classic Indiana game he learned growing up, and the adults in our group played countless hands over the week. It's addictive! A trip can be just the time to break out old favorites like gin rummy or sheepshead. 20. Uno is a game that takes specific cards that's doable for elementary-age kids, and you likely already have a pack stashed somewhere. Other fun ones are Phase 10 and Skip Bo . 21. 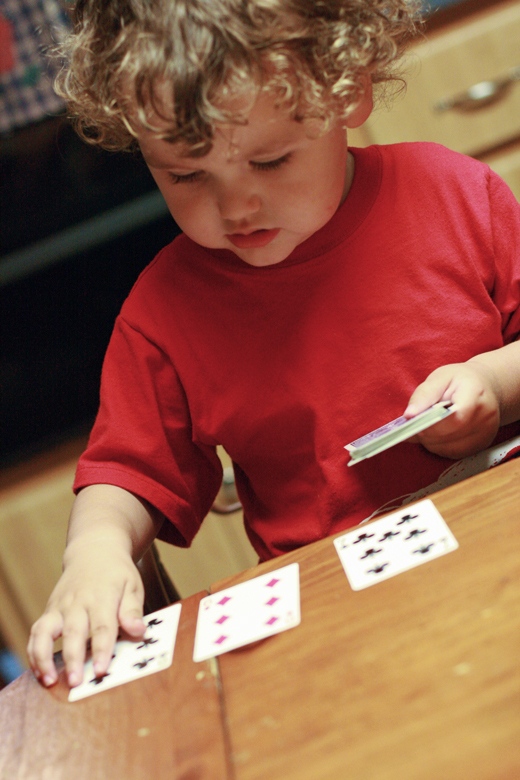 For slightly younger kids on up, Go Fish and some version of Memory can be perfect. For Go Fish, obviously you don't need specialized cards, but they can be fun! Other ideas include Old Maid and Crazy Eights , and I apologize for both names. 22. Sam hams it up as he loses the Game of Life . Let me tell you, that is one trippy, capitalist board game. I'd forgotten what it was like, but I found it in the closet at my parents' house and couldn't resist blowing off the dust. Bringing a full board game along might be too much, but you also might be able to find some at your destination, or you can search out a travel version of your favorite. Other options for kid-friendly but adult-tolerable games (elementary age on up) include Yahtzee , Scrabble , and Pictionary . I honestly have this keychain version of Scattergories that has slipped into our backpack on many a trip. 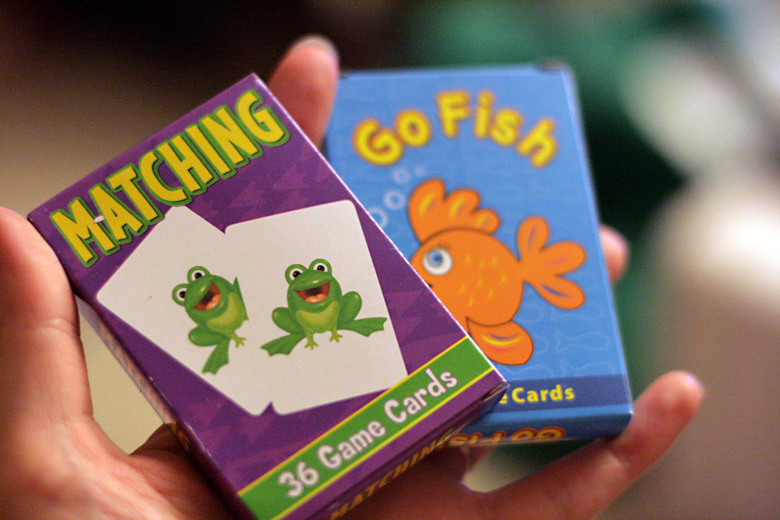 There are also some children's versions of popular games that make it a bit easier for kids to play along. 23. Besides board games that might be available, take advantage of toys that are not new but are new to your children, whether they're discovered in your parents' attic, borrowed from neighbors, or purchased on the cheap at a local thrift shop. Mikko tests out my brother's vintage Cozy Coupe here, and he couldn't get enough of the huge stash of wooden trains at Grandma's house in Michigan. 24. Because craft decorations are one of Mikko's favorite activities, at home or abroad, we made sure to bring additional fun elements to add to his creations. Anything small and futzy I put into smaller bags or containers so they wouldn't go absolutely everywhere. This idea can also apply to indispensable toys with small parts. If you don't like the baggy idea, there are lots of reusable and eco-friendly options out there for travel storage, both soft-sided and hard-sided. I'll be showing you a few soon when I review some of my travel snack pictures! 25. 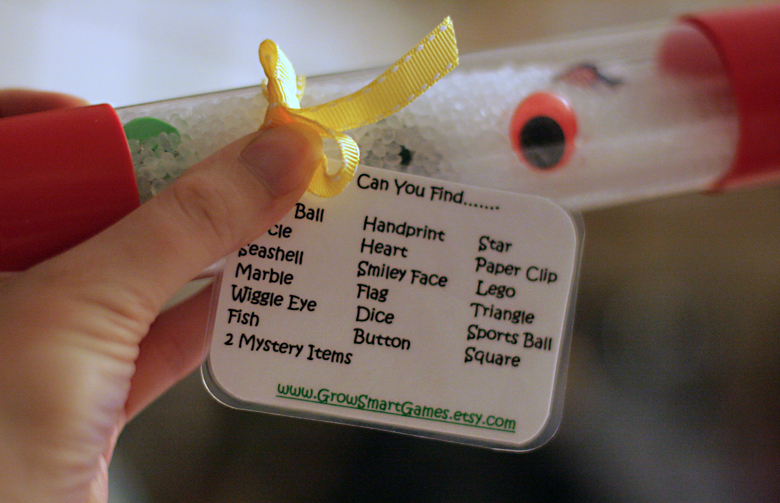 Both kids got a kick out of the I Spy Stick we got from Grow Smart Games, a new twist on the I Spy genre of toys. Obviously, you can use this one either on the way or when you're there, since it's self-contained. 26. 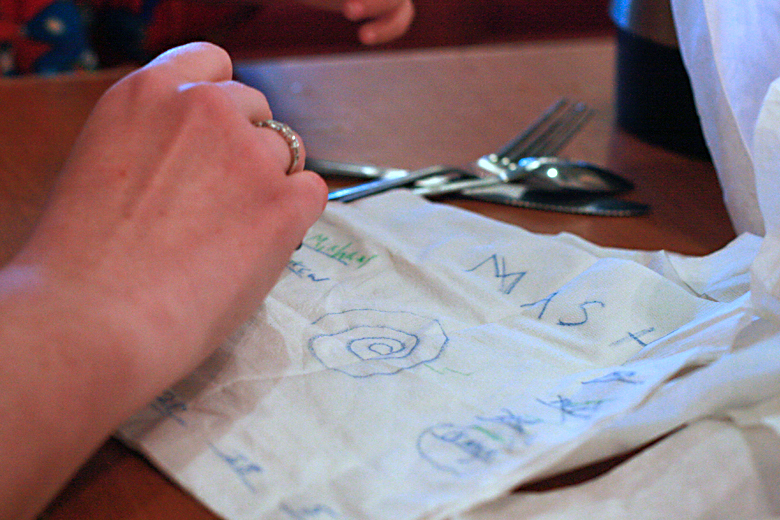 Old-fashioned games can keep kids occupied during long waits when they're supposed to be sitting still, such as when we were at a nice-ish restaurant here. 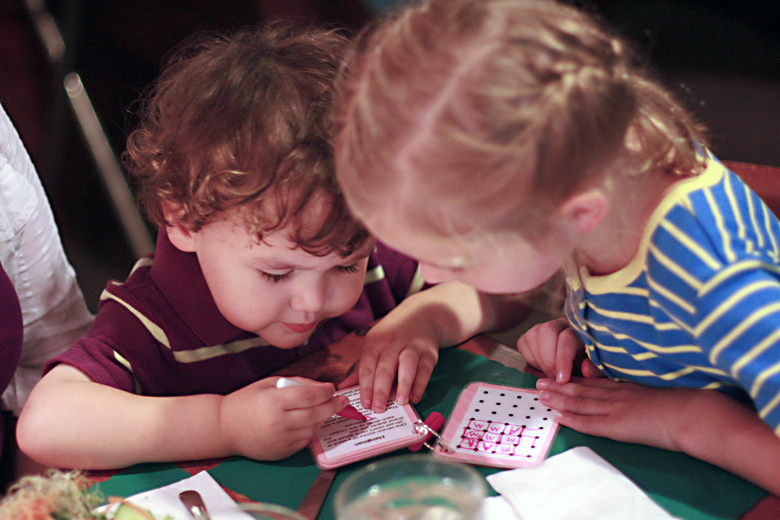 Pull out old favorites like Hangman, Dots and Boxes, Tic-Tac-Toe, The Alphabet Game, Twenty Questions, and so forth. You can scribble on a convenient paper napkin or placemat as needed, or you could get My Pocket Games, a set of five popular games, laminated on cards and bound with a dry-erase marker, from Grow Smart Games. Because this is so portable and contained, it can also be used handily in a moving vehicle — as long as it's not by the driver. You can enter to win your choice of a My Pocket Games or I Spy Stick by next week, December 7. I know it's hard to choose, but you could always pick up the other at Grow Smart Games; they're affordable and would make creative and unique gifts. This contest is open to U.S. and Canada. 27. I found this packet of prompt cards at the consignment shop and thought they were pretty creative. They give ideas for little games to play wherever you are, like looking for items of a certain color or asking deep questions of the other players. 28. 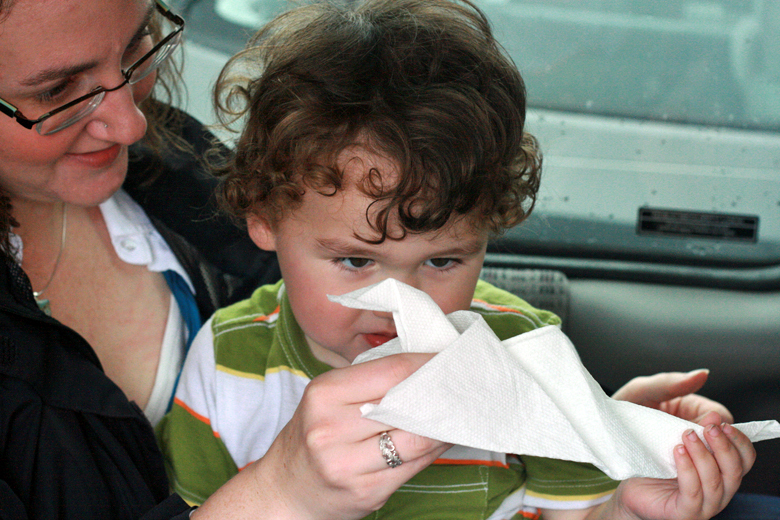 Another option that's easy to do on the go is origami, if you know what you're doing. Sam has a couple go-to designs, like this bird with a tail you can pull to make the wings move. He made this one out of a paper towel he found on the floor of my parents' car because he's resourceful like that. He managed to keep a passel of cousins amused at a family barbecue with just such creations. You might want to practice a few in advance. 29. 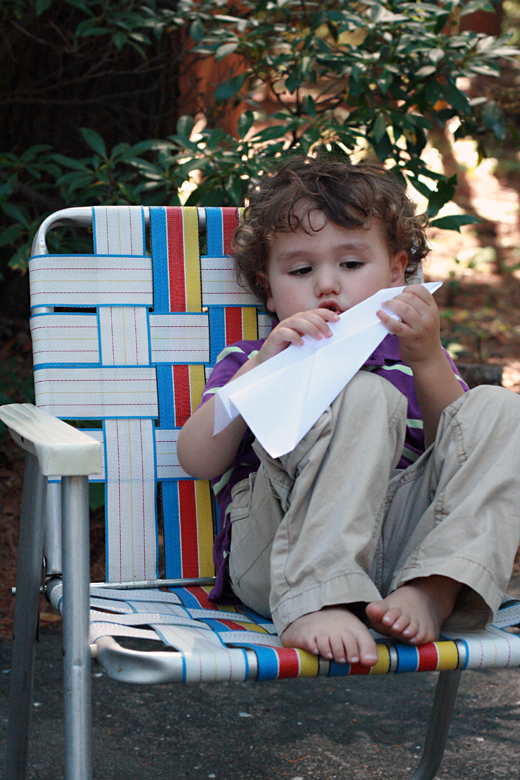 If most origami is too advanced for you or you've forgotten it all (author raises hand), paper airplanes are also always a hit. I recommend not making them indoors if there are non-participants nearby to fly into. 30. 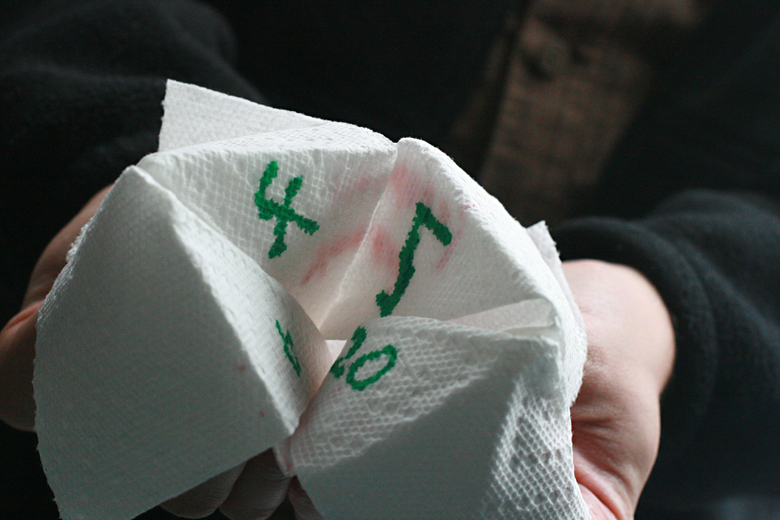 Another option that's easy to make on the fly is an origami fortune teller. Sure to amuse kids of primary school age! 31. Speaking of fortune telling, I broke out the game I remembered fondly from elementary school lunches: MASH, i.e., Mansion Apartment Shack House. As it turns out, I never actually married that dreamy boy from third grade or drove a Porsche. But that hasn't lessened my enthusiasm for the game, or for making creative variations on the choices. Sam ended up making a category for how many pairs of underwear the player would have when grown up, which sent my niece into a fit of giggles when it turned out to be only one. 32. This tip depends on what resources you have available as well as your philosophies concerning your children and screen time. 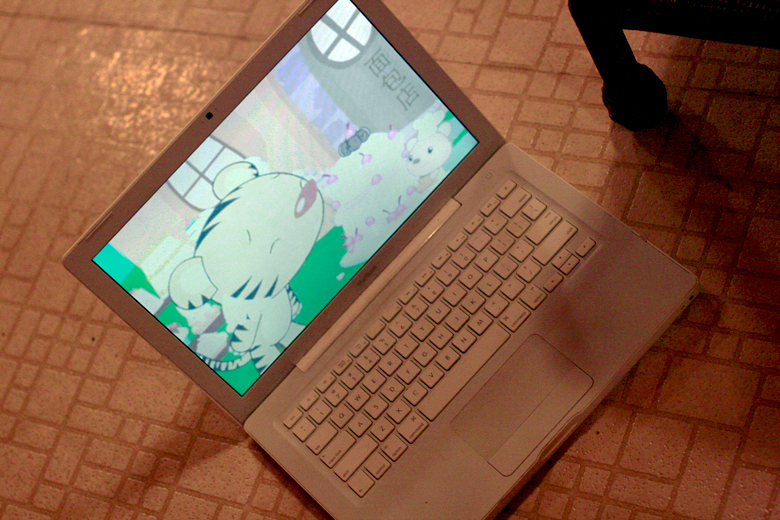 We found bringing along our laptops with a couple favorite DVDs, as well as hooking in to some kids' videos online (if you have an internet connection), was helpful for winding down after an overstimulating day. If you plan to use a laptop in a plane, bus, or train where other people are around, make sure you accustom your kids to wearing earphones ahead of time. We thought Mamma Mia was going to be our fallback lifesaver on our long flight, and Mikko wouldn't keep his headphones on his head. 33. Even if your kids don't usually watch TV, it might be a fun experience to snuggle together and watch a family movie. Here Nana, Mikko, and my niece take in a Little House on the Prairie special on yet another stormy afternoon. 34. I've always been a huge fan of playing beauty salon. I seriously even did my grandpa's hair once. He looked gorgeous! 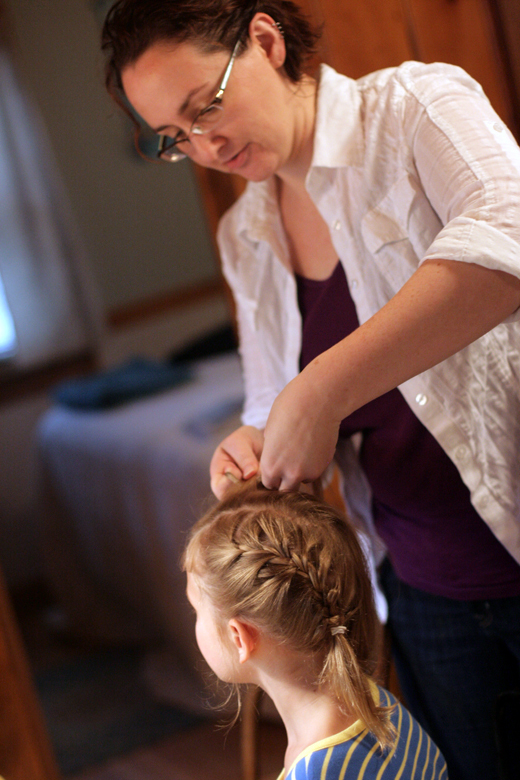 Teach someone your favorite tricks, like French braiding. 35. As with the secret stash of toys on the journey over, it can be a good idea to reserve a few small surprises in store to break out if the boredom begins at the destination. Sam and I brought yo-yos for the kids and showed them a few tricks. Another idea might be kazoos all around for a kazoo band. (Be cautious with this idea in enclosed spaces!) You don't need to spend money on these items; just look around the house for something you have tucked away that your kids haven't seen in awhile. 36. 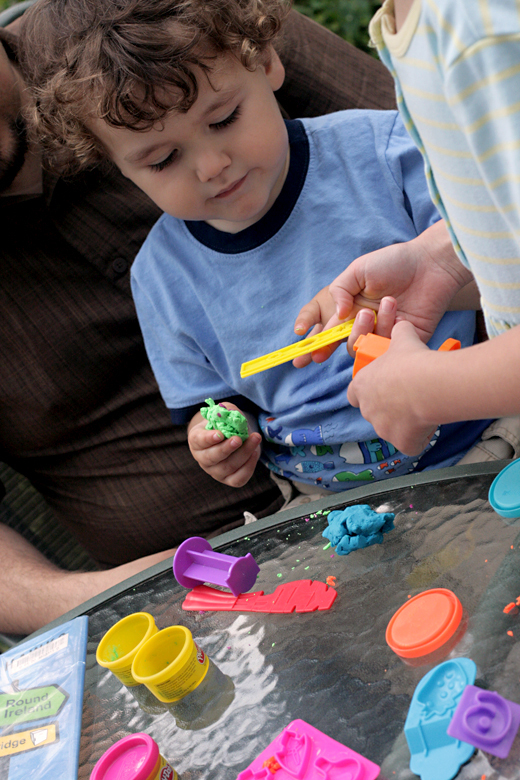 We brought some little tubs of various types of play dough and a collection of smaller tools. 37. If your child can't part with tiny little vehicles and action figures and dolls, pop them into a travel bag and bring just a small selection you can rotate. We brought these on the plane, too, and they stayed mostly contained while Mikko drove them across the tray table and the armrests. I don't have a picture of all of the other myriad things you can do while traveling, whether on the way or at the destination, such as singing campfire songs in harmony, playing charades, looking for different license plates, and so on. For instance, I memorized a whole slew of elephant jokes to keep my eight-year-old laughing. (She loooves elephant jokes!) I'm sure you'll come up with something clever all on your own next time you or your kids are bored! Hey, look, here come the elephants over the hill. 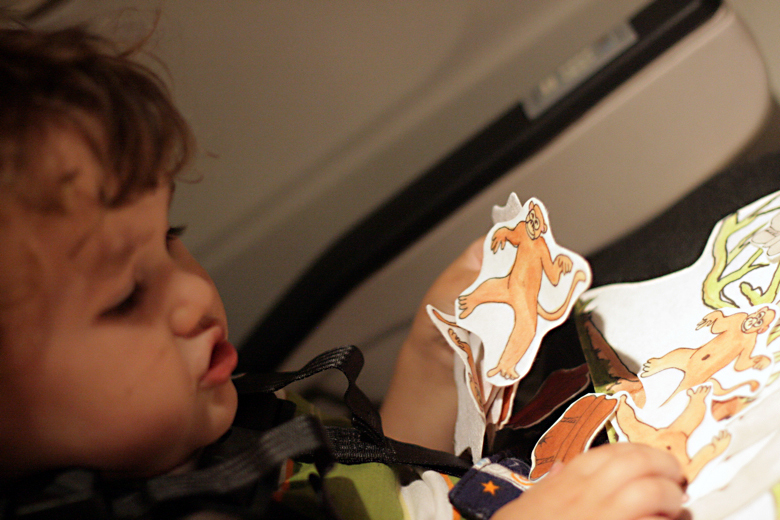 What goes in your luggage or carry-on for amusing children while traveling? and the giveaway products were sent to me for review. you might find if you were shopping for a similar option. 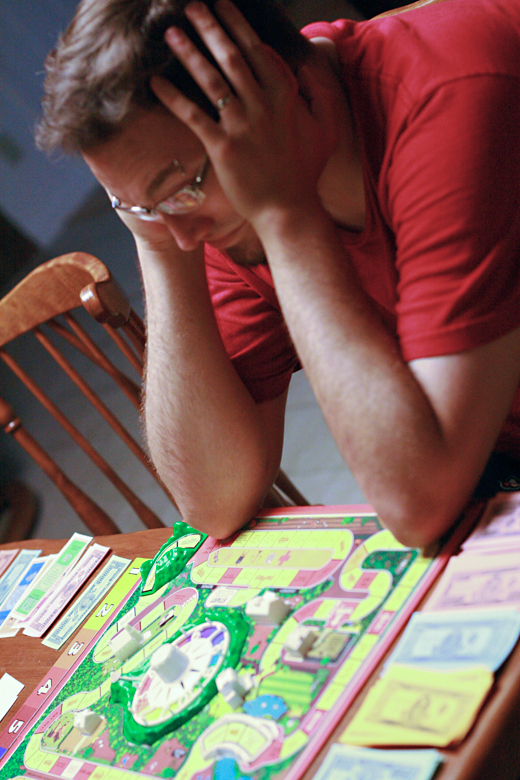 I searched for a long time for an old edition of The Game of Life. It was a favorite of mine growing up and I still love it. You should seriously check out the newer edition next time you're in the games section. It is crazy how much it has changed, especially if you get the chance to actually read the spaces in comparison to the old version! What a very helpful post! And congrats on "winning." Does this mean you get published or anything? How can one read this fine novel/novels of yours? Congrats on Nano. I saw your other post from your personal blog and added you as a writing buddy for next year! What a great post! So many fun things to try! I am big believer in packing lots of (small & portable) things to rotate out over the course of travel (or just boring-for-kids places like restaurants, meetings or appointments). I use "activity bags" very similarly -- for folks who don't want to buy stuff, there are lots you can make or assemble at home. The "novelty" factor really works well -- if its something they don't get everyday, or all the time, it can really capture their attention for awhile. Thanks! love your site! I am an unschooling mama of seven and am a new follower.